We still have a long ways to go until Gamestop’s Black Friday 2019 sale arrives. But you can scroll down the page to check out the details from their last Black Friday sale to get an idea of what’s likely to come. Enjoy! 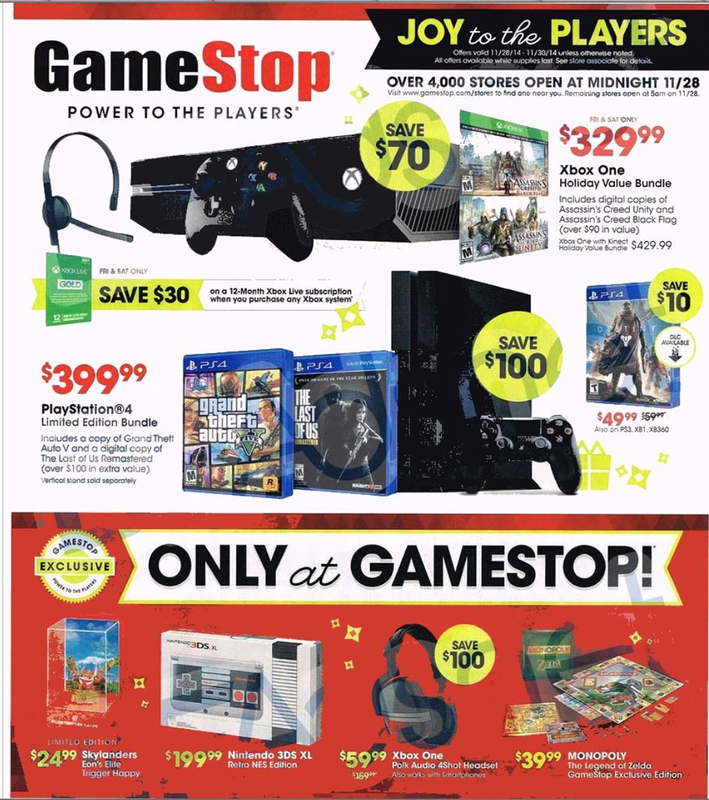 Updated on Sunday November 18, 2018: Gamestop’s Black Friday ad is here! To shop the sale, visit gamestop.com. Happy bargain hunting! What new games or gear are you planning on picking up this holiday weekend at GameStop? Let us know in the comments section (you’ll find the comments at the bottom of this page). 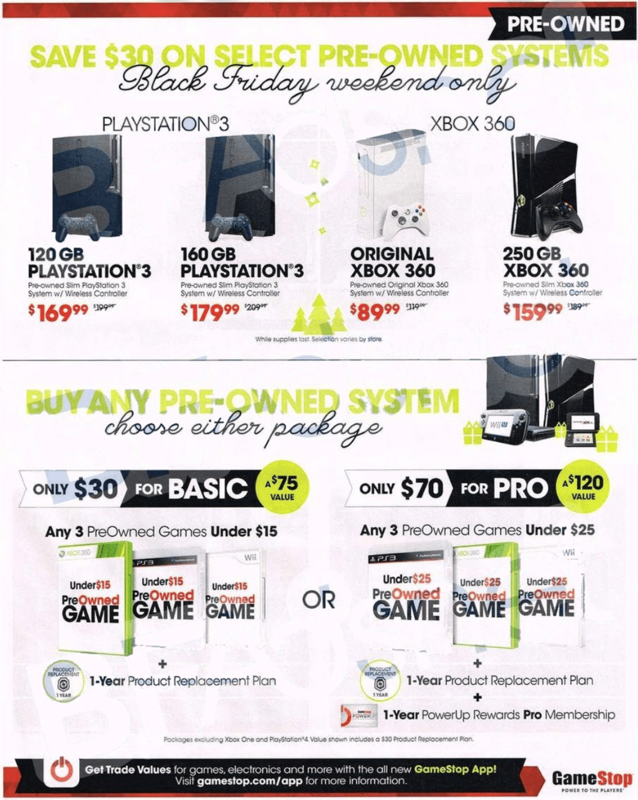 Updated on Thursday, November 16, 2017: For all you Playstation, Xbox, Wii, and PC gaming fans, Gamestop’s Black Friday 2017 ad had just been leaked! Check it out below – Enjoy! Just a quick note, all offers in the ad are valid Nov. 23—26, 2017 unless otherwise noted. The sale begins at online in the early morning hours on Thanksgiving day and in-stores later that afternoon at 4:00PM (Nov. 23). You can expect some of their hottest items to sell out in a matter of minutes and they do each year. For details and to shop the sale, visit gamestop.com. Happy bargain hunting! 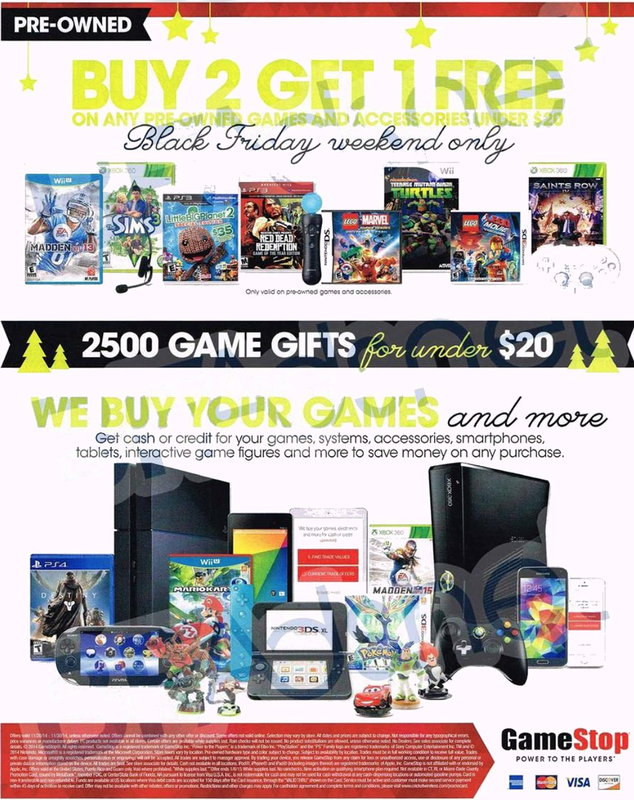 Thanksgiving may still be a week away but Gamestop’s Black Friday ad has just been leaked. It’s posted below in it’s entirety so check it out to see what’s coming this holiday weekend. Just a quick note, stores will be closed on Thanksgiving day, but you’ll already be able to pick up the deals online as you chow down on your Thanksgiving dinner. Stores open on Friday (that’s November 25th this year) at 5:00AM with the deals lasting all the way through Sunday (November 27th) or while supplies last. Some of the hottest deals will likely sell out in the first half-hour or less so be sure to be quick with anything you are eyeing to get. Happy shopping! 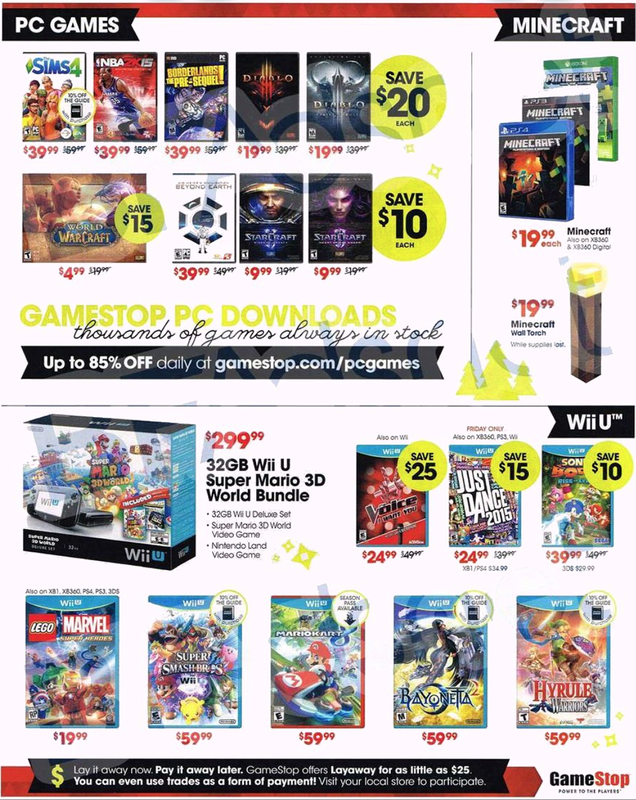 Gamestop’s Black Friday Ad for 2015 has just been released. We’ve posted the full Ad scan below – Just follow the page links at the bottom of each page to view ad scan separately. 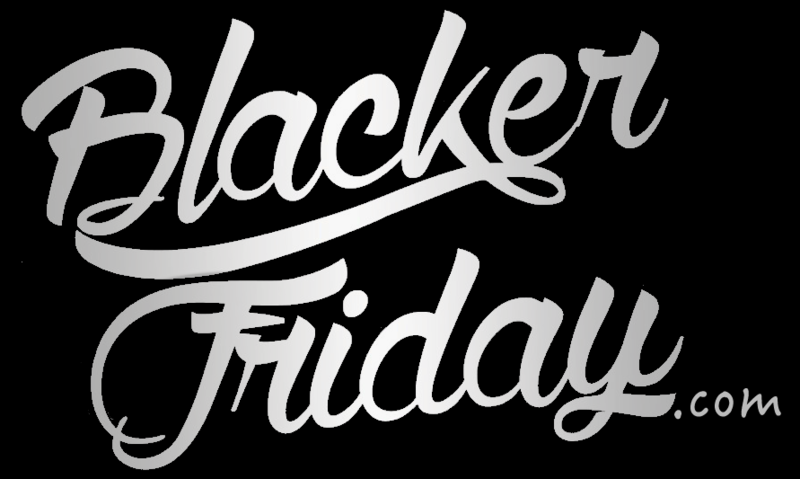 Stores open at 5:00AM on Black Friday, November 27th, and the sale will be live up until Sunday, November 29th. Just keep in mind that there a number of doorbuster deals that will only be available in the first few hours of the morning to the lucky few (the hottest deals tend to sell out quickly). You’ll also be able to pick up all of these offers online as well. 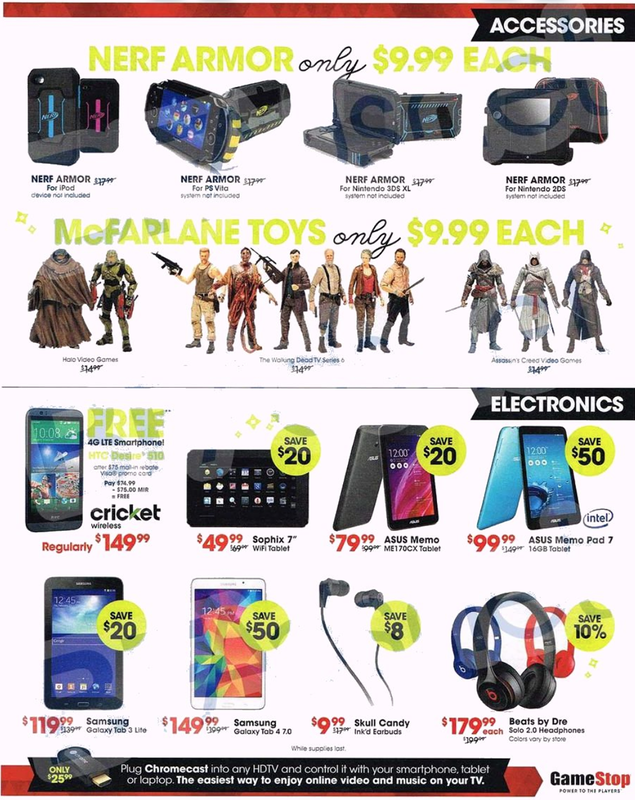 Here on page 2 of 12 of Gamestop’s Black Friday ad scan you’ll see all of their Xbox One bundle deals that are all $50.00 off. Of course that’s o top of the already lower bundle discount. That includes the Xbox One 1TB solid-state hybrid drive Elite Bundle that’s on sale for $449.99, the xbox One 1TB Holiday value pack for $349.99, or the Xbox One 500GB Gears of War Ultimate Edition Bundle for just $299.99. 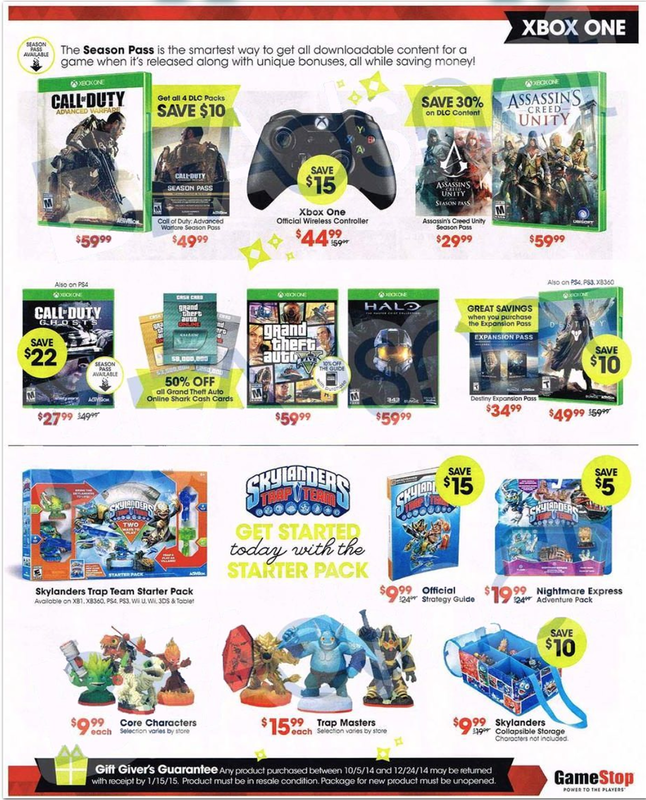 You can also save on some new games including Fallout 4 for $59.99 and Halo 5 for $59.99. And this is also a good time to update your Xbox Live Subscription as you’ll be able to save $10.00 on a 3-month subscription if you order it by Saturday afternoon. 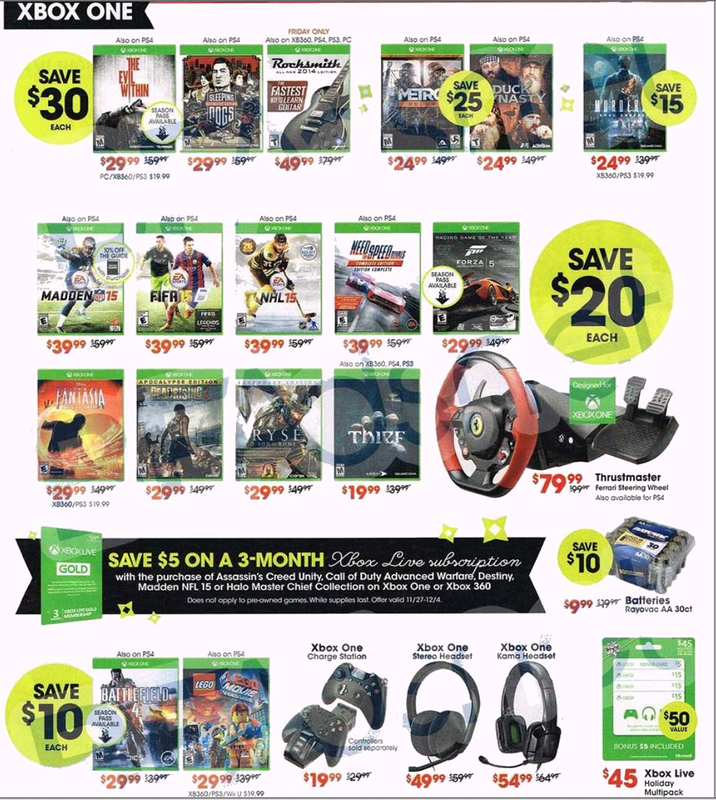 Here on page 3 of Gamestop’s ad scan the Xbox One game deals continue. You’ll be able to save $20.00 (that’s about 40% or so) on The Witcher Wild Hunt, Zombie Ary Trilogy, FarCry 4, Gears of War, and Lego Jurassic World. You can also pick up a new fancy limited edition Lunar White Xbox One wireless controller for just $44.99. 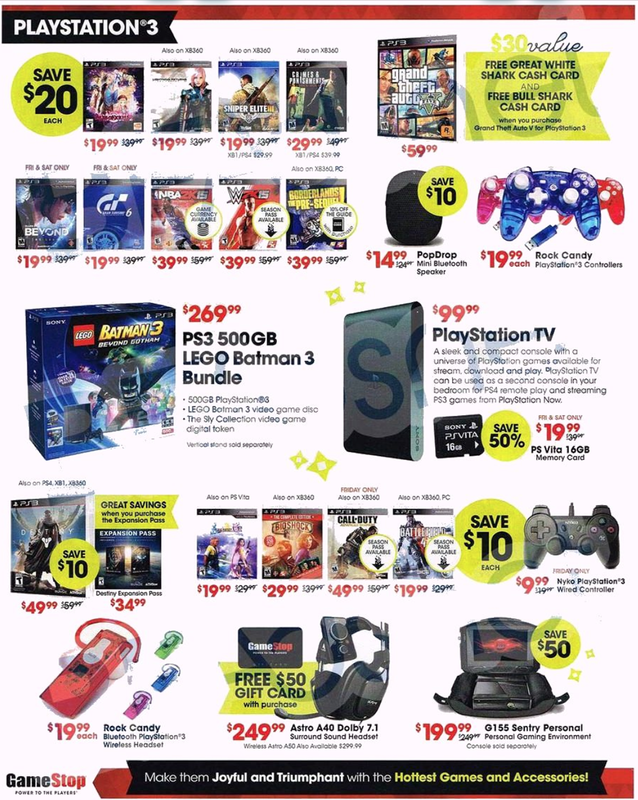 On page 4 of Gamestop’s Black Friday ad scan you’ll save the Rock Band 4 Guitar Bundle that’s just $129.99 (game + guitar). You’ll also be able to save between $15.00 and $30.00 on a new Xbox One headset. And don’t forget to checkout some of the used games in stock as you can find some really good deals on pre-used game starting as just $6.99/each. 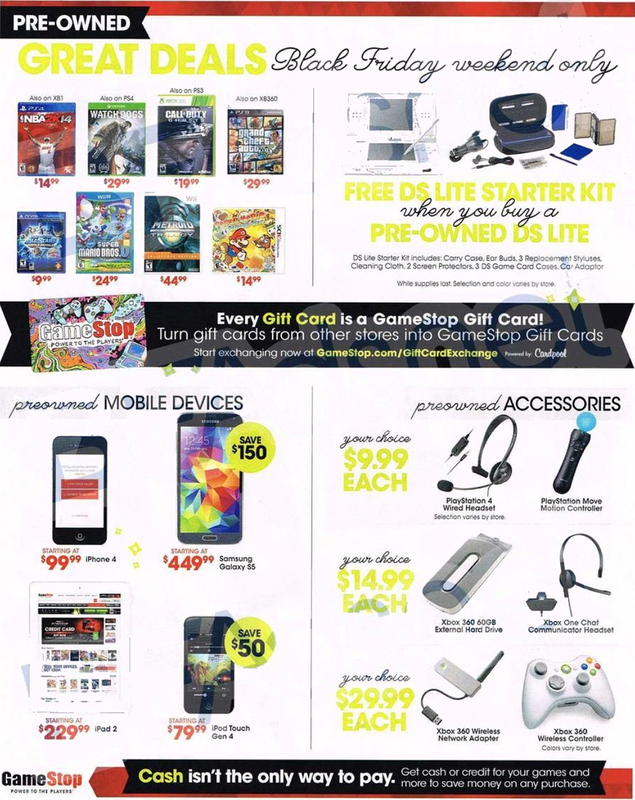 And here are the rest of pages in Gamestop’s Thanksgiving weekend ad scan. It includes deals on Playstation 4, PS3, and pc games so be sure to check these all out in details. Just please give it a second to load up as the images are big. The Black Friday deals form Gamestop have arrived! Over 4000 of their stores nationwide, will be opening their doors at midnight on Thanksgiving evening. The remaining stores will open at 6am so just be sure you know the timings for the location nearest year. 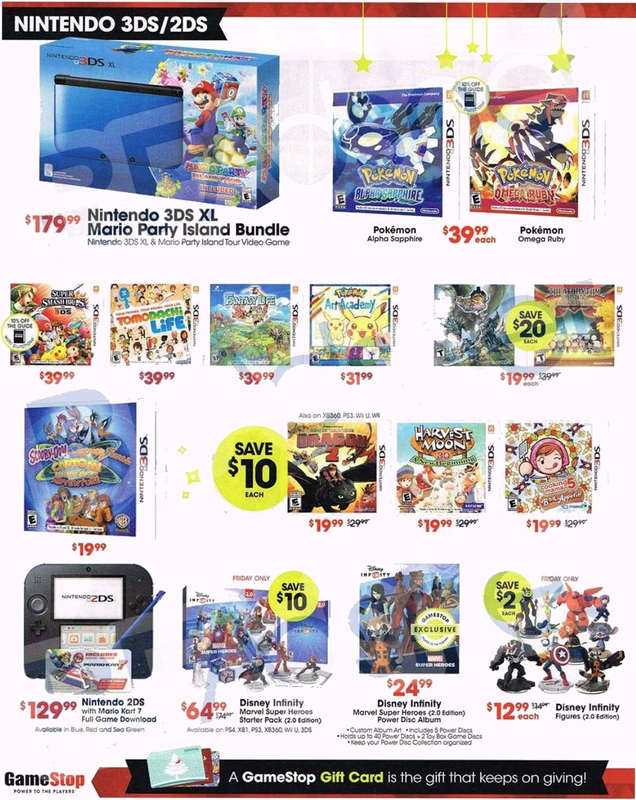 Or if you’re lazy and don’t to fight with some dud for the last game, then you can head on over to gamestop.com for many of the same deals. For Xbox One gamers, you’ll save $20.00 to $30.00 on many of the latest titles. On sale for $24.99/each you’ll be able to get Duck Dynasty, Metro Redux, or Murdered: Soul Suspect. For $29.99 you’ll be able to pick up The Evil Within or Sleeping Dogs Definite Edition. And for just $49.99 you can get the 2014 edition of Rocksmith. For all Xbox 360 players, there are a number of sporting games on sale. 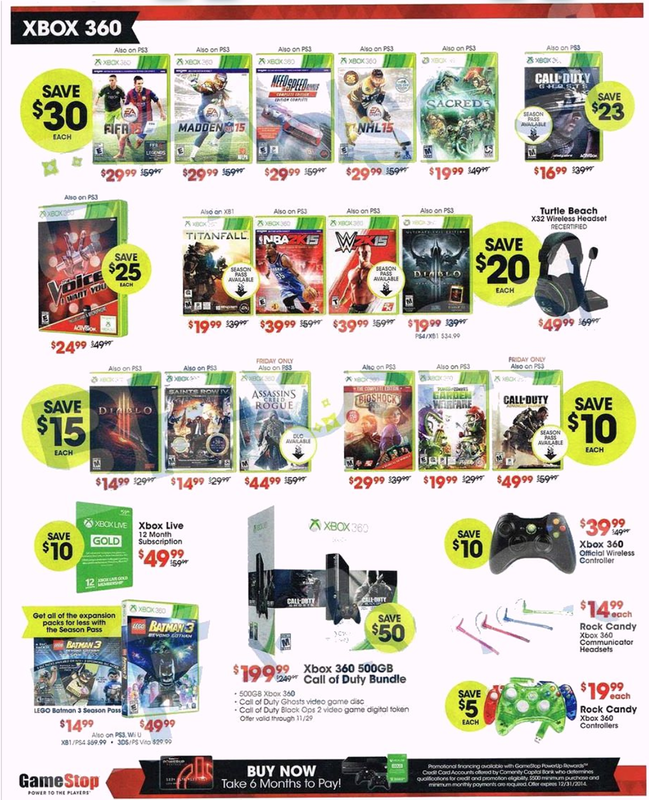 That includes Madden 15, FIFA 15 and NHL 15 which are all $29.99/each (regularly $59.99). You can also pick up The Need for Speed Rivals Complete Edition for $29.99 or The Voice for $24.99. Be sure to check out the equipment on sale as well including the Turtle Beach X32 wireless headset for $49.99 and extra game controllers for as low as $39.99/each. 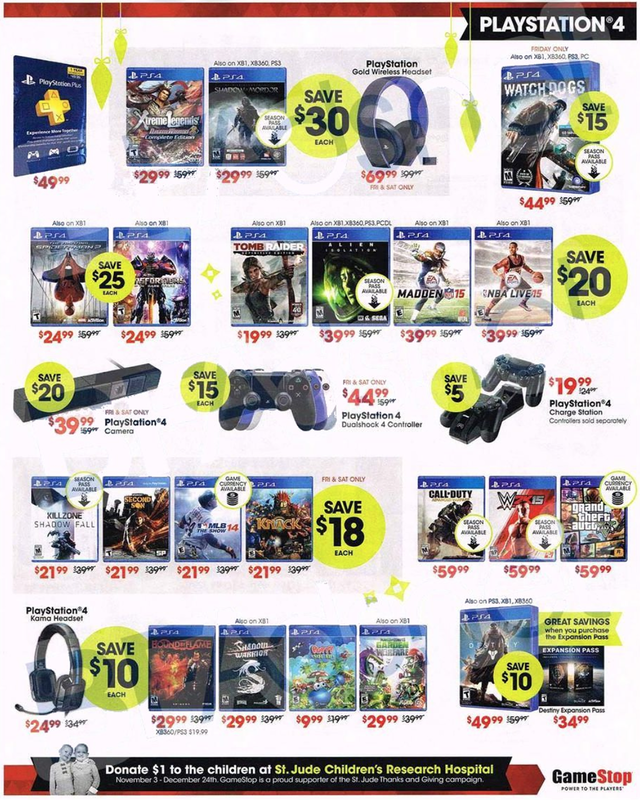 Playstation 4 users also enjoy up to $30.00 off on elect games. Our favorites include Middle-earth: Shadow of Mordor and Dynasty Warriors 8: Xtreme Legends Complete Edition, both which are on sale for $29.99. Some of the older games that have been out for some time can be picked up for as low as $19.99, including Tomb Raider: Definitive Edition. Gamestop’s Black Friday sale is also a good time to pick up some new gear for your Playstation 4. Check out the Dualshock 4 controller for $44.99, the camera for $39.99, and the Gold Wireless Headset for $69.99. In terms of game consoles, you really have only two offers to choose from. The first is the Xbox One Holiday Pack for $329.99 ($70.00 off). It includes Assassin’s Creed Unity and Black Flag games. If you want to get it with Kinect then it will clsot you an extra $100.00. Your second option is to get the Playstation 4 Limited Edition Bundle that includes a copy of Grand Theft Auto V and The Last of Us Remastered. Most of these sale prices will only be valid on Friday and certain items may sell out early. If they do at your local store, then you can still try to see if you can order it from gamestop.com ad stores will not be offering rain checks. Be on the lookout for new onlince-exclusive deals coming for Cyber Monday. Search for the nearest Gamestop store in your neighborhood. If you have order related questions or need product return assistance then you can contact GameStop Customer Service by phone at 1-800-883-8895. The line is open daily from 8:00AM to 8:00PM (CST).